Good morning and happy Monday! Thank you for beginning your week with #ThatBusinessShow with your host, Jamie Meloni. We want to give a special thanks to our Guest Host, Topher Morrison, who hosted #ThatBusinessShow while Jamie was out stuck in the well. He did spectacularly, and we had several great guests. If you missed Topher Morrison last week, head over to http://www.tampabayradio.com to listen to his and any of our shows on demand. Today we had three wonderful guests, ready to be interviewed by Jamie on #MorningAir! Name discussed with our listeners what he was really up to last week, he was at a Coldwell Banker convention in Chicago, as Jamie was ranked number four in the nation for sales! 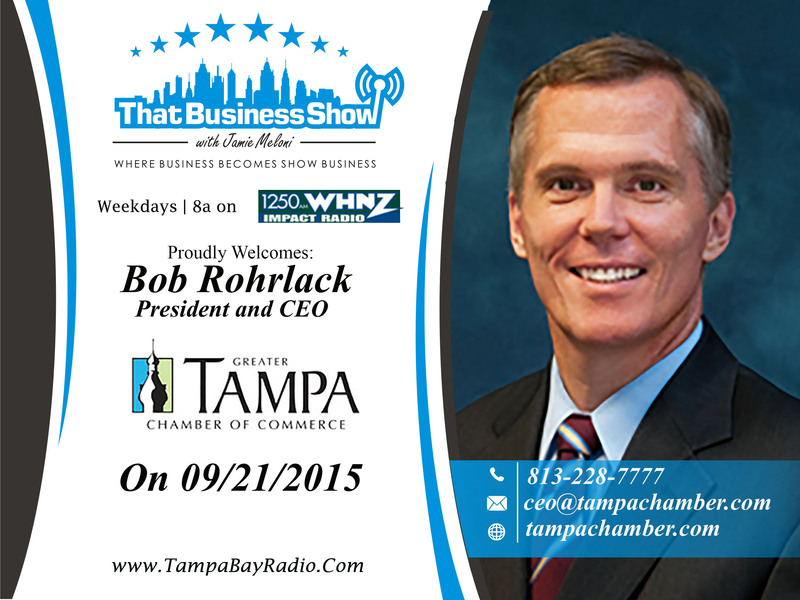 Up first on #ThatBusinessShow was Bob Rohrlack, President and CEO of The Greater Tampa Chamber of Commerce – the voice of business in the Tampa Bay area! Next on the show was Kyle Matthews, Co-Founder of Because of Ezra – a charity that raises money for child neuroblastoma. Our last guest here on the show was Ryan Gautier, Owner of Ryan G Productions! If you missed today’s show, go check out http://www.tampabayradio.com to listen to the show on demand and if you want to see the live stream, head to my YouTube channel at www.youtube.com/Jamiemeloni. Thank you for joining us on #ThatBusinessShow with your Host, Jamie Meloni every weekday at 8am on #1250whnz! Helping support the city of Tampa and her economy, we welcomed Bob Rohrlack, President and CEO of The Greater Tampa Bay Chamber of Commerce. Together with the Chamber of Commerce, Bob Has worked to include financial management, innovation development, technology transfers: economic developments, and even the military in the city of Tampa. With an estimated savings of over $3 billion, Bob and the Chamber have helped Tampa become more prosperous. Jamie and Bob discussed The new sister city agreement with South Dublin, Ireland. They also spoke briefly about what makes a community work, and that people need to come together to make progress. The Greater Tampa Bay Chamber of Commerce also works to teach young entrepreneurs how to run their businesses and have the skills they need to become successful. Learn more about the Greater Tampa Bay Chamber of Commerce at ceo@tampachamber.com or visit their webiste at http://www.tampachamber.com. 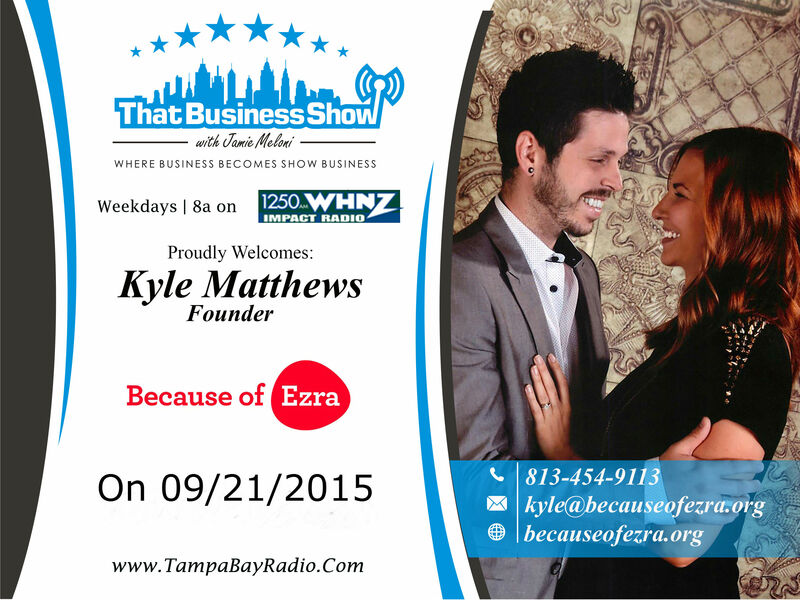 Joining us next on #ThatBusinessShow with our Host, Jamie Meloni – is Kyle Matthews, Co-Founder of Because of Ezra, a charity that focuses on child neuroblastoma. Jamie and Kyle discussed with us how losing his child to neuroblastoma cancer in 2010 inspired him to fight against cancer with the Because of Ezra Foundation. The goal of the foundation is to raise money to support clinical trials which can make a difference in child survival, and put forward resources to meaningful research. But the end of 2015, nearly $700,000 towards research will have been funded through Because of Ezra. They are hosting a fundraising event at The Orpheum in Tampa on Sep. 26th, they will have a live band, karaoke, and an open bar – all of which will benefit childhood cancer research. Learn more about Kyle Matthews and Because of Ezra at kyle@becauseofezra.org visit their website at http://www.becauseofezra.org. 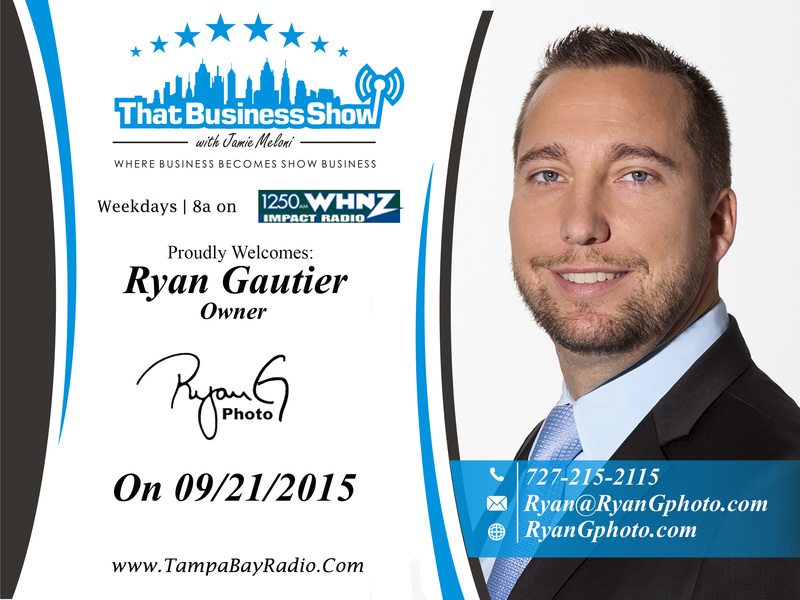 Our last guest on #ThatBusinessShow with your Host, Jamie Meloni was Ryan Gautier, Owner of Ryan G Productions. Having no practicing photography whatsoever, and learning through Google tutorials, Ryan is now an award-winning photographer, internationally syndicated for 12 years of creative work. Ryan now helps companies with their brand using photography and videography. Through his company, he donates over 100 hours of time to charities around Tampa Bay and is now on several boards. Ryan and Jamie discussed this with love his passion for photography, which you can learn more about at Ryan@RyanGphoto.com or visit his website at http://www.ryangphoto.com. This entry was posted in Articles, Entrepreneurship and Business and tagged business, photography, radio, show business, talk. Bookmark the permalink.